You are what you eat – but first, you are what you cook. The author was baking bread from age five, but did not suspect an inherited disposition until the 2008 meeting with maternal and paternal cousins featured on the front cover. The food memories between have been 65 years in the proving, from Mum’s prodigious baking and student surprise at Graham Kerr’s cuisine to OE Ocker fusions of meat and fruit, snails and quail in Paris and London and the food-challenged Celtic homelands, returning to alternative experiments and pursuit of the perfect meat pie. 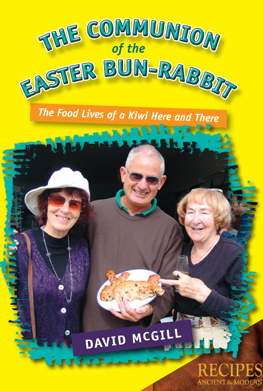 This personal and social history of evolving and retro Kiwi cuisine draws on diaries, letters, journalism and clippings from a lifetime of national and global roaming. Stories include a disastrous non-lunch with Peter O’Toole and a restaurant meal with George Cole that was worse, a hair-raising prelude to tea with Sir Ralph Richardson and the Duke of Edinburgh’s friend threatening deportation at a Norwich welcome lunch, the author witnessing the Godfather of Kiwi Café Culture taming his All Black guests. 70 original recipes include an English cookery writer’s roast goose, a Kiwi cookery writer’s ‘Attic Chicken’, an English/Kiwi playwright’s pork and prunes, and dozens of heritage family favourites including brandy snaps, Louise cakes, pitta bread pizza and real Russian borscht, with a wine writer’s formative imbibing and the author’s bakes on bread and marmalade. 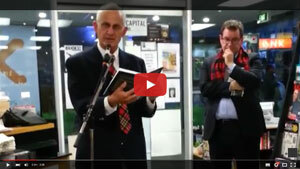 ‘Witty and entertaining.’ Graham Beattie, Beattie’s Book Blog. Copyright © David McGill 2011-2018. | All Rights Reserved.